dead architects | Real people don't hire architects...? Church Living: evolution or devolution? Church converted to a house. For centuries architects have borrowed design ideas and details from religious buildings. If we were brutally honest, we might find that 75% of the designs found in a typical architectural history book first appeared on some religious building. That said, the elements were rearranged into some new form or use or usually both. For example we see the plan and form of an ancient Roman basilica evolved over time into high architecture as it combines with a myriad of other motifs to become the standard form used in the design of a Christian church. Check out the garage. Can it be original? These days we forgo the rearrange and reassemble part and jump directly to the reuse. How would you like to live here? First glance tells us that things could get a bit crowded, as one could never be sure that the good Lord deigned to move out. Also, what does one tell the parishioners who unwittingly show up for service on Sunday morning? No one thought to change the commercial entry to something with more residential appeal. There was, though, a salute to the all important automobile. Looks like someone added a two car garage. Maybe it is time to let some architect come up with a little devolution. Praising the sum of the parts. 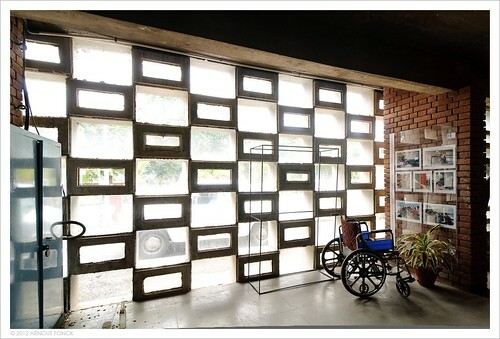 Since site cast concrete buildings can be engineered and built with primitive methods, hand labor and local materials, it is not surprising that social, economic and very real physical conditions have provided a home for Modern Architecture in virtually every tropical climate zone on the planet. Also, mid century pioneering projects like Le Corbusier’s complex in Chandigarh, India; Lucio Costa and Oscar Niemeyer’s Brasília; and Lou Kahn’s National Assembly Buildings in Bangladesh, had the far reaching effect of validating modernist efforts in tropical locations until today, when it might even appear, to those of us who live in the world of tortured steel, glass, plastic, engineered wood and stone building, that time has stood still. In India the case could be made that this is doubly true because of the national tendency to decorate all things modern with temple motifs. We are left with a sense of parallel worlds, existing side by side but somehow never quite assimilating. It is occurs here, to the bungalow in the photos, with actually quite pleasing results. Maybe it is time we stop expecting the whole to materialize, and be happy with the sum of the parts. As a a sometimes student of all things architectural educated in the “Western Tradition” I am prone to assign historical styles as a way of valuing architecture. Modernism arrived in India, along with independence, in 1947 at a time when there were about 300 trained Indian architects in a country with a population of 330 million. 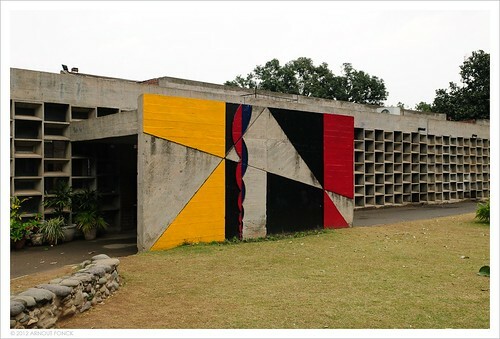 As a result, architecturally the new way forward was destined to be lead by European architects and students of the “European Modernists Movement in Architecture,” not the least being Le Corbusier who realized his vision in the city of Chandigarh. The impact of Modernism was immediate, pervasive and very real. Architecture in India since Independence has been not only exclusively Modern in Style but further, in the tradition of Le Corbusier, site cast concrete has been/is the prevailing building material. Anyone traveling around India today will find a Modernist building-scape imbued with remnants of “High Colonialism” juxtaposed against the ever present and essential “hut” of the rural village and the tarp and stick maize of the urban slum. Close inspection reveals that concluding that only the last two are native is probably a mistake, for today Indian offices, apartments, schools, public buildings and private houses are clearly, for good or ill, where new flesh is being put on the structural bones of “Modern Architecture.” To be continued…..India Part II: New Flesh on Old Bones. Newtons 3rd Law of Tiny Houses? Is this tiny house a modern day version of Marc Antione Laugier’s Primitive Hut? Attention: unemployed students, overworked homemakers, empty “nesters,” outdoor enthusiasts, and all economically challenged humans with/without pets and extended family! According to numerous posts buzzing across the “blogisphere” the answer to your housing “whoas” has arrived in the form of a tiny house; leading me to wonder, are we returning to the Primitive Hut of Marc-Antoine Laugier’s Essay on Architecture(1753), an important work read by architecture students, and a plea for rational thought amidst late renaissance architectural excess? I would guess that the operative word is excess, as in the ever present 4000 square foot mansions populating the the US sprawl-scape and attending my conclusion that in this case Newton’s Third Law may be the one to watch. All photos used under Creative Commons.